Using of node.js is optional. Some scripts may use embedded language, some may use only old js implementation. 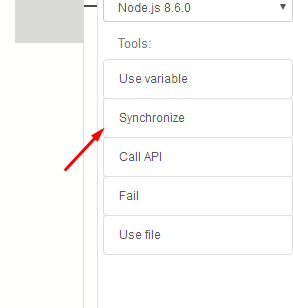 To include node.js inside the script you are working at, need to enable it in settings panel. Installing language needed only on first run or when module list is changed, so when you restart BAS, it will start instantly second time. Embedded languages may be used inside compiled script as well, and installing language distro is also performed after running compiled script for the first time. Start with simple example and put inside code editor. Function log from console class is integrated into BAS environment, and running it will display message inside “Log” panel. BAS variables can be used to send data inside embedded code. Variables also may transferred data to BAS script, so you can save hash result into new variable and use it inside BAS script when hash will be computed. 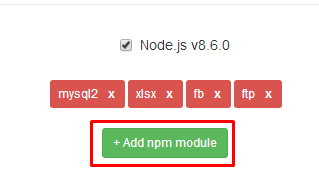 Open settings dialog again and click on “+ Add npm module” button. 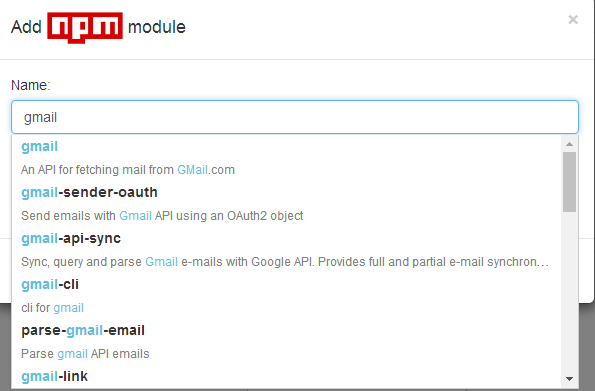 This will bring module find dialog. After changing module list, BAS will run install procedure again, later you can use your newly installed module inside any action. This example reads file and has one peculiarity - the order in which code will be executed. Despite the order in which functions are written(first “Done” and than “Next”), this code will be executed in reverse order(first “Next” and second “Done”). This happens because of readFile function, it starts operation and returns immediately, and only when operation of reading file is complete, callback function will be called. Most of node.js functions which may take some time uses that approach. The idea is to add lines, which are marked red and place resolve() call in the place, where block execution will end. After synchronization, you can be sure, that next line will wait until previous block will finish. “reject” function may be used with “resolve” to throw exception from synchronized function. You can call any BAS action from node.js code, including working with browser. 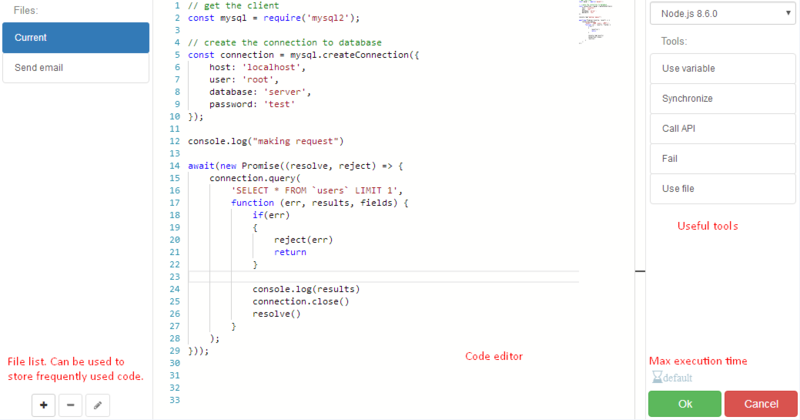 To call any BAS api method, you need to use BAS_API function and pass string with api string. Fortunately, you can just copy and paste any action right into code editor. In that way you can write script entirely on node.js. var token = "YOUR TOKEN"